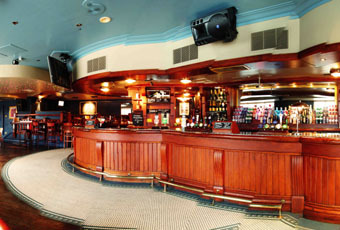 Nicholson's pub that is a short walk along the waterfront from Canary Wharf tube. Doesn't look much from the outside. But, inside it has a wide selection of ales. St Austell Nicholson's Pale Ale, Purity Mad Goose, Fuller's Off Piste IPA & London Pride, Brew York X-Panda, Long Man Old Man, Dorset Brewing Company Frosted Jack, Adnams Sloe Storm & Ossett Yorkshire Blonde. There were a few in. But there was still plenty of seating available. Staff behind the bar looked a little bored at times. There were plenty of them, suggesting it's normally much busier. Probably one of the best options for a beer in this area of the city. Had a reasonable pint in here. For a bar at the bottom of an office block and given the area it's okay. At least it doesn't have 'greeters' at the door waiting to show you to a table. Still gets rammed on a Friday night but the beer range here is excellent. On my last visit I had a very good pint of stout from an unknown brewery (didn't have a chance to look at the pump clip). Some people have problems with chains pubs but I like Nicholson's as a chain, they are always well run and the beer choice is normally excellent. Not cheap but it's Canary Wharf after all. Possibly one of the very few Canary Wharf pubs you'll catch me in. I like it because the ale is of decent quality despite being a really busy place. Can't beat a bit of busy, it gets rammed out on Thursday/Friday late afternoon and evenings but the ale is good, the service fine and understandable on busy times and it's a decent furnished to a standard 'On the Wharf' pub. "At least they have a good range of beer - last night they had pride, doombar, and tribute as well as 5 guest 'christmas ales' "
You're quite right there. It's a Nicholson's pub, so there's always plenty of choice and usually pretty good qulaity s well. Agree, it is the best choice in the Wharf area, unless you want to walk half a mile to The Grapes which is much better.